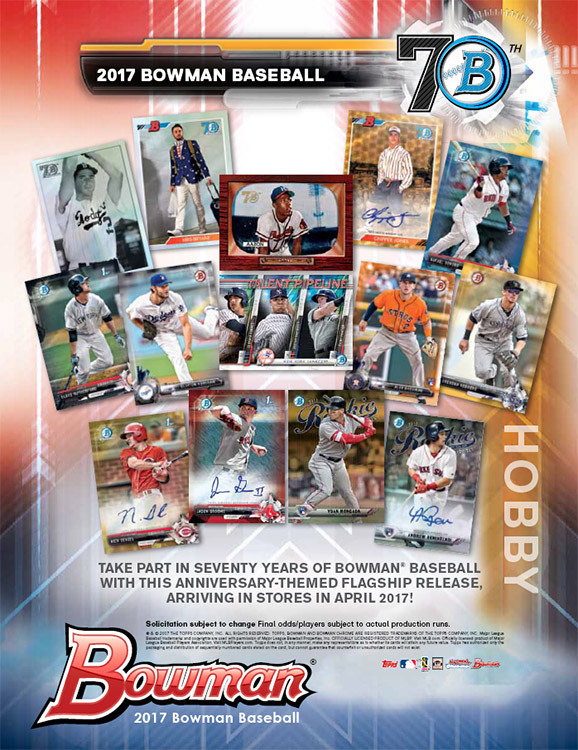 Bowman® Baseball ($96.95 Hobby Box and $193.95 JUMBO Box) returns Wednesday to celebrate the SEVENTY historic years since its inaugural release! Look for specially inserted throwback card designs, vintage buybacks, and famous reproductions, while collecting current chrome cards and autographs of the game’s Future stars! 2017 Bowman® Baseball – a celebration of past and present – will remain The First Place to Find the Game’s Future Stars. We invite you to celebrate our 70th anniversary with us in April 2017! In celebration of Bowman’s 70th anniversary, 2017 Bowman® Baseball will showcase limited-edition insert and autograph content. 1948 BOWMAN Recreating the first-ever Bowman® card design and featuring a combination of active MLB® stars, retired greats, and current-day prospects. 20 hand-drawn originals to be inserted exclusively into HOBBY & HOBBY JUMBO BOXES! Orange Parallel: sequentially numbered. HOBBY BOX ONLY! 2017 Bowman® returns with vibrant Shimmer Refractor Variations and an extensive array of Chrome Refractor Parallels. Look for the year’s biggest prospects, including the most touted international World Baseball Classic tournament participants! Find a multitude of low-numbered color variants. Orange Refractor: sequentially numbered to 25. HOBBY BOX ONLY! Red Refractor: sequentially numbered to 5. SuperFractor: numbered 1/1. HOBBY SKUS ONLY! Paper Base Cards will continue as a vital element of 2017 Bowman® Baseball. Featuring the biggest names of MLB®, including highly-touted rookies Alex Bregman, Yoan Moncada, and Dansby Swanson. Orange Border: sequentially numbered to 25. HOBBY BOX ONLY! Red Border: sequentially numbered to 5. The 2017 Bowman® Baseball Hobby Jumbo Box will continue to deliver 3 autographed cards per box. Featuring ON-CARD autographs of the top prospects of MLB®. Refractor Parallel: sequentially numbered. HOBBY ONLY! Purple Refractor Parallel: sequentially numbered. HOBBY ONLY! Blue Refractor Parallel: sequentially numbered. HOBBY ONLY! Gold Refractor Parallel: sequentially numbered. HOBBY ONLY! Orange Refractor Parallel: sequentially numbered to 25. HOBBY ONLY! Red Refractor Parallel: sequentially numbered to 5. HOBBY ONLY! SuperFractor Parallel: numbered 1/1. HOBBY ONLY! Printing Plates: numbered 1/1. HOBBY ONLY! Additionally, look for returning low-numbered Shimmer Refractor Variation Autograph Parallels! Featuring top rookies of the 2017 MLB® season. Highlighting the top players at each level of the Minor League™ system. Look for the popular subset to return in 2017, featuring the top 100 prospects as ranked by our Bowman Scouts. Orange Parallel: sequentially numbered to 25. HOBBY ONLY! Additionally, look for limited, sequentially numbered autograph variations! In celebration of its 70th anniversary, Hobby and Hobby Jumbo Boxes of 2017 Bowman® Baseball will include unannounced surprises as well as the following additional content. BOWMAN BUYBACKS NEW! HOBBY ONLY! Look for original Bowman and 1st Bowman cards, to be featured exclusively in Hobby and Hobby Jumbo Boxes! Also find Bowman Buyback Autograph variations! Sequentially numbered. All-America Game Autographs HOBBY ONLY! Showcasing today’s top prospects who played in past high school All-America showcases. Bowman Ascent Autographs NEW! HOBBY ONLY! Featuring elite young veterans of MLB®. Sequentially numbered.